Robert Goren is a fictional character featured in the NBC-USA Network police procedural and legal drama television series Law & Order: Criminal Intent, portrayed by Vincent D'Onofrio. Goren is a detective investigator first grade for the Major Case Squad in the New York City Police Department (NYPD). His badge number is 4376. He is partnered with Det. Alexandra Eames (Kathryn Erbe). As created by executive producer René Balcer, Goren is an intense, extremely intelligent, and imposing man, but is also unpredictable and sometimes volatile. He appeared in 141 episodes. A highly intelligent, emotionally intuitive man, Goren has a talent for forming complex psychological profiles and understanding the "why" of even the most unusual crimes. While intellectually gifted, he has many personal demons, and his eccentricity and unconventional investigative methods sometimes rub his colleagues the wrong way. Goren himself once described his policing ability by stating, "I am an acquired taste". Even his partner, Alexandra Eames, was at first so puzzled by his methods that she asked for a new partner. She eventually came to respect his abilities, however, and the two became very close. Robert O. Goren was born on August 20, 1961, and grew up in the Canarsie neighborhood of Brooklyn, near The Rockaways. A phenomenally bright young man, he took the Minnesota Multiphasic Personality Inventory in his senior year of high school and was sent to speak with the school counselor and school psychiatrist as a result. He was an altar boy in the Roman Catholic Church. Goren's mother Frances (Rita Moreno) first started showing symptoms of schizophrenia when Goren was seven years old. In later years, she is hospitalized at the fictional Carmel Ridge mental health facility. She is then diagnosed with lymphoma which eventually results in her death. Goren is estranged from his older brother, Frank (Tony Goldwyn), a drug addict who also has a gambling problem and is depicted as being sometimes homeless. Frank has a son, Donny, who asks for help when he is incarcerated. To that end, Goren goes undercover in the prison's psychiatric ward and uncovers a culture of prisoner abuse. While he saves his nephew, he is suspended for his unorthodox investigation. When Frank refuses to help him help Donny, Goren disowns him. While high on drugs, Frank is murdered by Goren's nemesis Nicole Wallace (Olivia d'Abo). Frances' husband, whom Goren had believed to be his father (see "Mark Ford Brady" section below), gambled frequently on horse races and was a serial adulterer. He left Goren's mother when Goren was 11, making little effort to stay close to the family. In season 2, a personal friend of Goren's mentions a funeral, implying that the elder Goren had died before the series began. In the episode "Endgame", serial killer Mark Ford Brady (Roy Scheider), anxious to delay his scheduled execution, arranges for Goren and Eames to interview him about victims not yet attributed to him. Goren, with help from his brother, pieces together a story which shows that Brady and Frances Goren had a relationship, which continued until Robert was four and Frank was seven. Goren asks his mother on her deathbed about Brady; she replies that she doesn't know whether Brady is his father. At a later date, Goren reveals that he has DNA evidence that Brady was his biological father. Goren served in the U.S. Army's Criminal Investigation Division and was stationed in Germany and Korea. He joined the NYPD as a detective, serving in the Narcotics Division, and later as a detective in the Major Case Squad. His mentor, FBI criminal profiler Declan Gage, taught him how to use his intelligence, empathy and imagination to construct complex psychological profiles of suspects. Goren also learned how to use his physicality to intimidate and unsettle people while interrogating them, the most famous example being his habit - introduced in the pilot episode, "One" - of cocking his head at odd angles in order to maintain eye contact with someone who is trying to avoid his gaze. 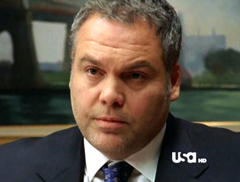 In the backstory of Criminal Intent, Goren has been partnered with Det. Alexandra Eames (Kathryn Erbe) since sometime before 2000, posted to the Major Case Squad under Captain James Deakins (Jamey Sheridan) and later Captains Danny Ross (Eric Bogosian) and Joseph Hannah (Jay O. Sanders). Goren is temporarily partnered with Det. G. Lynn Bishop (Samantha Buck) in the third (2003–2004) season while Eames is on maternity leave. One of his most significant relationships throughout the show is with Nicole Wallace, a brilliant con artist and serial killer who is first introduced in the episode "Anti-Thesis". Wallace is one of the few criminals Goren encounters who is able to outwit him and even get to him emotionally, particularly by confronting him about his unhappy childhood. Goren comes to think of her as his "white whale". When Wallace murders his brother Frank, Goren is convinced that she is trying to destroy him at last; it turns out, however, that she was manipulated and murdered by the true mastermind of the plot - his old mentor, Declan Gage. In the episode "Untethered", Goren, on his own, goes undercover at an abusive prison where his nephew is incarcerated; he is then suspended and sent for a psychological fitness evaluation. While waiting for his reinstatement, Goren decides to go undercover to take down a high-level drug dealer, but does not inform Eames of this decision, causing tension between them. In the two-part season 9 premiere "Loyalty," he and Eames are pulled off a pair of homicides by Capt. Ross, who they do not realize has been working undercover for the FBI on a case involving one of the victims. When Ross is subsequently murdered, Goren and Eames team up with Detectives Zack Nichols and Serena Stevens to find his killer. Goren soon gets into a physical altercation with the prime suspect, leading to his suspension, though Eames and Nichols covertly help him with his side investigation. By the end of "Loyalty", Eames is promoted to Lieutenant and assigned as Captain (pro tem, pending her Captain's exams) of the Major Case Squad. Her first assignment is to fire Goren, upon which he tells her not to worry, kisses her on the cheek and they share an embrace before he leaves. Eames then places her own gun and badge on her new desk and calls the Chief to resign from the force. Neither Eames nor Goren appear for the remainder of the season. After a year's absence, Goren and Eames again became the series' lead characters in its tenth and final season. While it was not explained how or why they were reinstated to the police force, it is clear that one of the conditions is Goren's regular sessions with a psychiatrist, Doctor Paula Gyson (Julia Ormond). Their new captain, Joseph Hannah (Jay O. Sanders), also briefly refers to his and Goren's "friendship", perhaps implying that his character used personal influence in bringing Goren back to the force. In the Law & Order: Special Victims Unit episode "Acceptable Loss" which guest-starred Kathryn Erbe as Alexandra Eames, it is revealed that Goren has left the Major Case Squad. Eames, now working for the City/Federal Homeland Security Task Force, states: "My partner moved on and I decided that it was time for a change." Eames has also picked up some of Goren's old habits, such as cocking the head at odd angles when interrogating suspects. The following are the medals and service awards worn by Detective Goren, as seen in "Amends". His badge number is 4376. ^ a b "In the Wee Small Hours". Law & Order: Criminal Intent. Season 5. Episode 7. November 6, 2005. NBC. ^ a b "Anti-Thesis". Law & Order: Criminal Intent. Season 2. Episode 3. October 13, 2002. NBC. ^ "The Faithful". Law & Order: Criminal Intent. Season 1. Episode 4. October 17, 2001. NBC. ^ "The War At Home". Law & Order: Criminal Intent. Season 6. Episode 8. November 14, 2006. NBC. ^ a b "Untethered". Law & Order: Criminal Intent. Season 7. Episode 9. December 6, 2007. NBC. ^ a b c d "Frame". Law & Order: Criminal Intent. Season 7. Episode 22. August 24, 2008. NBC. ^ "A Person of Interest". Law & Order: Criminal Intent. Season 2. Episode 23. May 18, 2003. NBC. ^ "Blink". Law & Order: Criminal Intent. Season 2. Episode 20. May 4, 2003. NBC. ^ "Endgame". Law & Order: Criminal Intent. Season 6. Episode 21. May 14, 2007. NBC. ^ "USA Network character bio". USA Network. Retrieved 15 April 2015. ^ "Blind Spot". Law & Order: Criminal Intent. Season 6. Episode 1. September 19, 2006. NBC. ^ "One". Law & Order: Criminal Intent. Season 1. Episode 1. September 30, 2001. NBC. ^ "Purgatory". Law & Order: Criminal Intent. Season 7. Episode 11. June 8, 2008. NBC. ^ "Loyalty". Law & Order: Criminal Intent. Season 9. Episode 2. April 6, 2010. NBC. ^ "Vincent D'Onofrio back on 'Criminal Intent' for Season 10". USA Today. 2010-09-21. Retrieved 2017-11-04. ^ "The Consoler". Law & Order: Criminal Intent. Season 10. Episode 2. May 8, 2011. NBC. ^ "Acceptable Loss". Law & Order: Special Victims Unit. Season 14. Episode 4. October 17, 2012. NBC.